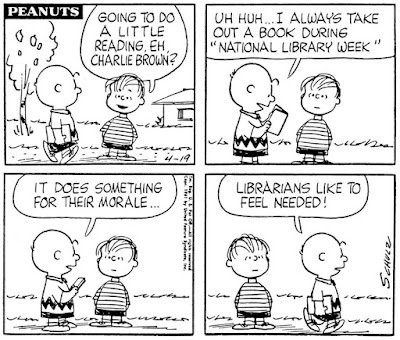 National Library Week is coming to an end. 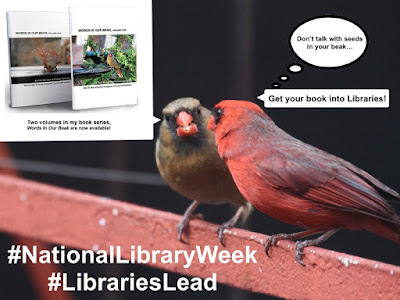 The event began last Sunday (April 8th) with the theme, "Libraries Lead," and in honor of #NationalLibraryWeek, the ALA (American Library Association) let libraries know that this past week was the perfect opportunity for them "to encourage their community to tell their stories." "This year, in keeping with the Libraries Lead theme, the ALA suggested that libraries ask patrons to let them know how the library led them to something of value in their lives." The ALA also annnounced a conest, promising, "one randomly selected winner will receive a $100 VISA gift card and a copy of 'Firebird,' the Coretta Scott King Award-winning book by Misty Copeland, 2018 National Library Week Honorary Chair..."
And they stated, "Library lovers can post to Twitter, Instagram, or on the I Love Libraries Facebook page during National Library Week for a chance to win." 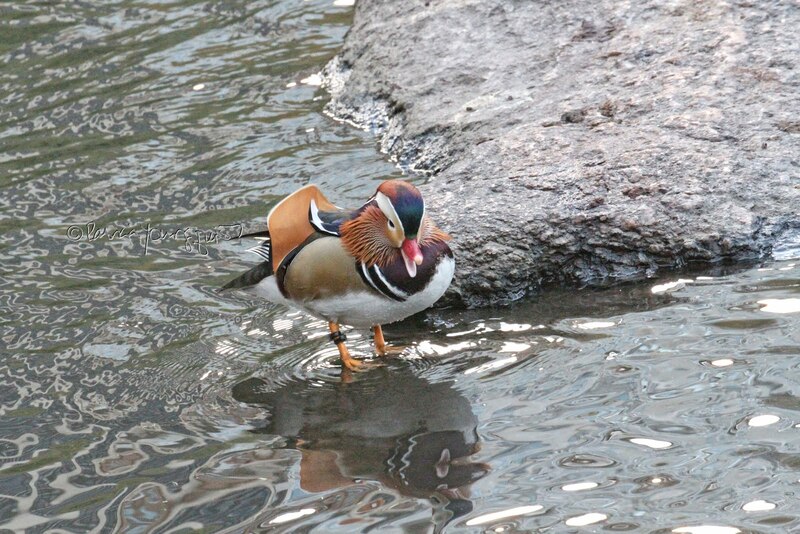 They informed persons who were interested in making a submission that,"Entries can be a picture, video, or text. Creativity is encouraged." The only "rule" that they listed was: "Just be sure they include the hashtags #NationalLibraryWeek and #LibrariesLead on their social media posting"
I will be submitting the photograph that can be seen atop this entry. 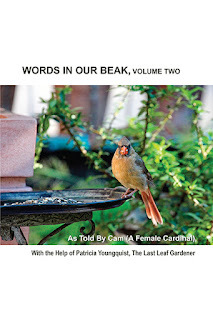 In it, Cam, my visiting cardinal, (who is familiar to my regular readers) can be seen (at the left) reminding her husband Mac (right) that two volumes of her book series, Words In Our Beak, are now available. One of the only thing Cam loves more than having her stories in book format is to be eating black-oil sunflower seeds, which she is munching on as she exercises her having-been-published bragging rights to her husband. As you can see he suggests that Cam get her books into libraries. In terms of libraries and me, growing up, my local library was a big part of my life. 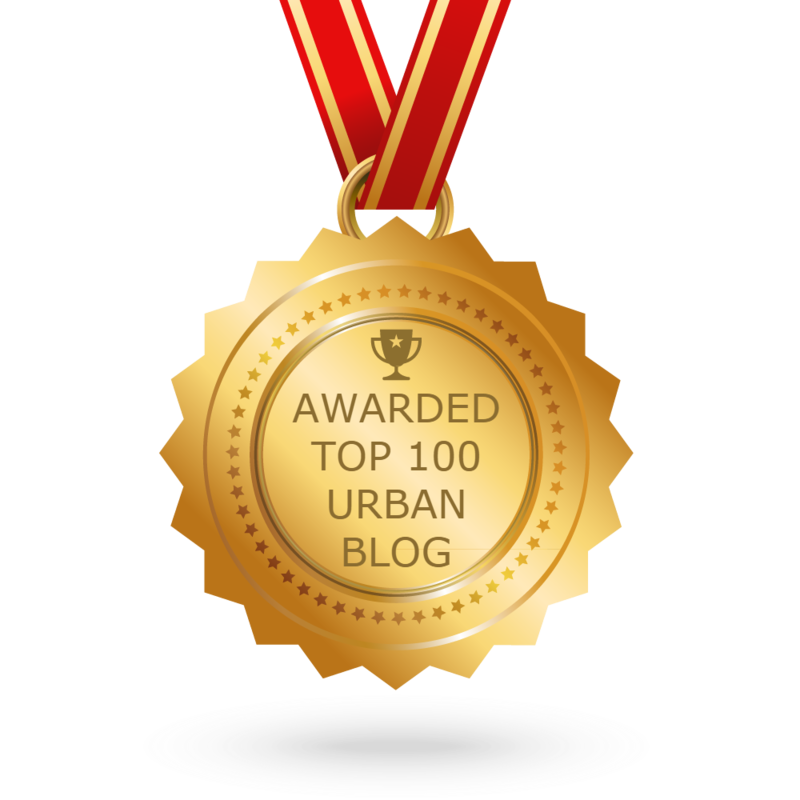 I attribute my love of reading (which is certainly something of great value) to this institution. Moreover, my love of reading led me to a love of writing. 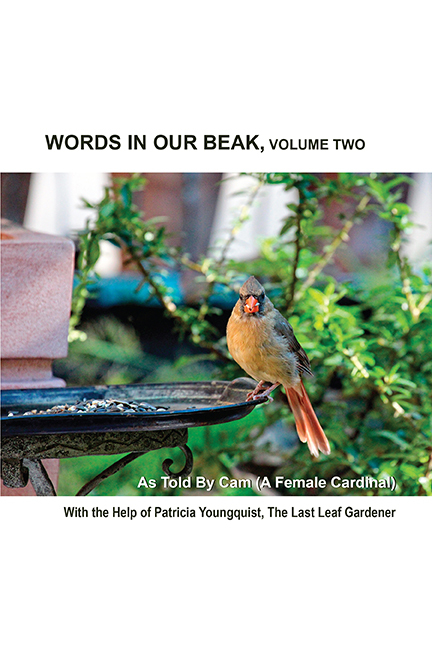 I'm happy to say that I have now published two volumes (through the Indie Publisher Ingram Spark) of the Words In Our Beak book series, where the story is told from the perspective of a female cardinal named Cam. 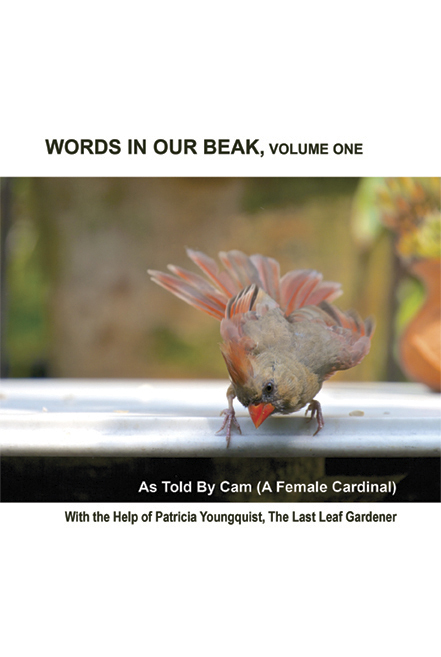 Just as ALA's theme for this year wanted to "encourage their community to tell their stories," my goal in the Words In Our Beak series, is to help Cam, the book's story teller to have her stories told without someone putting words in her beak. 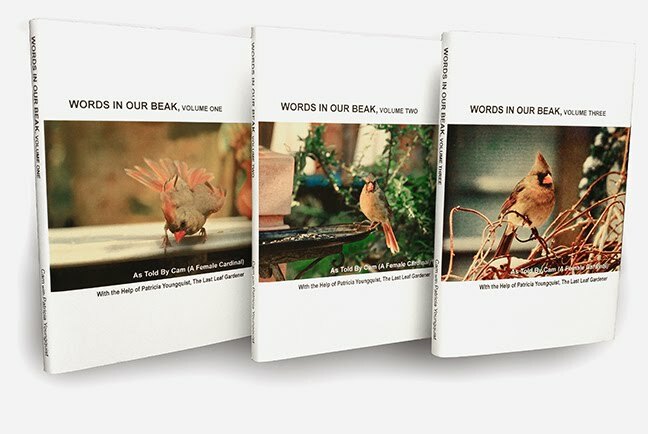 I am grateful to say that a number of people who have purchased volume one or volume two of the Words In Our Beak book series have donated a copy to their local library. This includes people who live in Illinois, New York and Massachusetts. 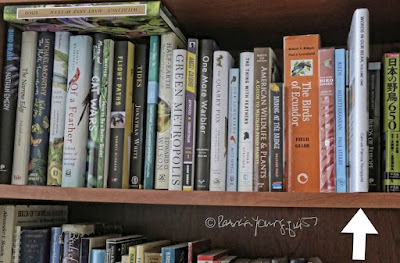 In terms of my book donations, I have this to say: because my the stories in my books are told from a bird's perspective and because I live in New York City, I donated volume one (seen directly below) to New York City Audubon's library (seen in the second image of the set below). Volume One has also been donated by someone who works for the New York Public Library. 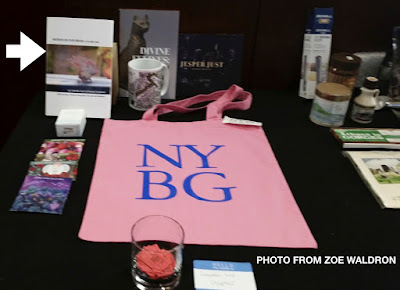 Her donation of my book went to a raffle (the box of prizes that included volume one of my book series can be seen below) sponsored by VRA (Visual Resources Association). As for volume two, being donated, Chaplain David De Simone gave a copy of it to NYC Audubon's library this past Thursday. 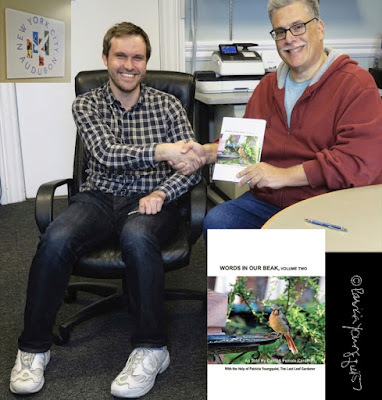 The cover of that book can be seen in the next image and in the picture after that one, Chaplain David can be seen (L) giving it to Andrew Masa (R) who is on their staff. 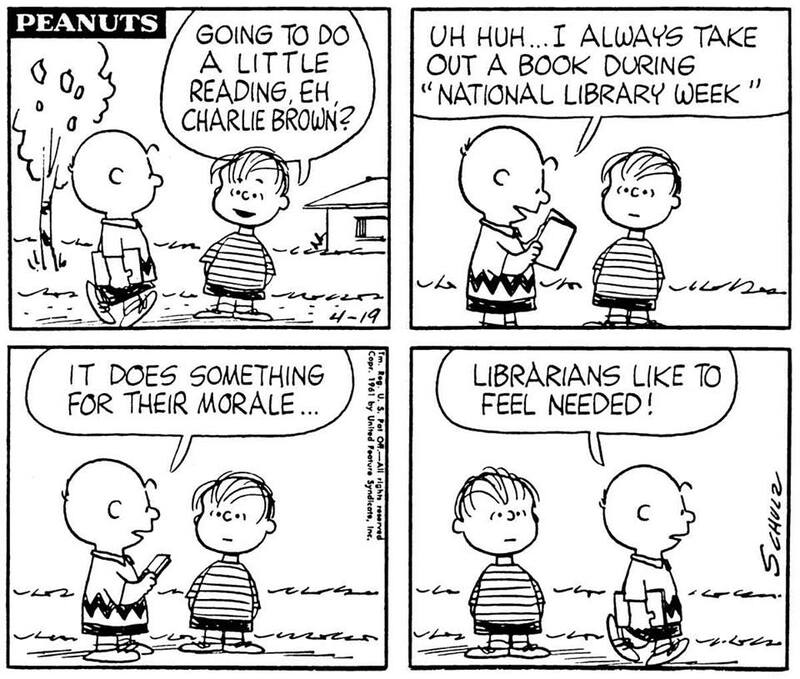 Meanwhile, dear reader, as 2018's National Library Week comes to a close, I'll leave you with a Peanuts Comic Strip that was created in honor of this event when it took place in 1961.